BTM Corporation of Marysville, Michigan was founded in 1966 by Mr. Ed Sawdon & Mr. Milus Allison as a manufacturer of bending machines for the automotive and appliance industries. The initials BTM were coined as an abbreviation for “Bending Tools & Manufacturing”. 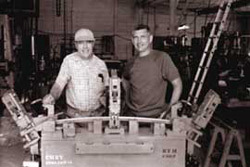 Ed Sawdon (Founder of BTM) & Art Richards (L) with a bending machine. 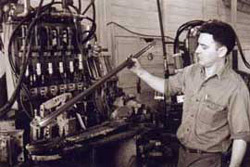 Milus Allison with one of the bending machines manufactured during BTM’s first year in business. BTM gained a reputation for high quality workmanship and problem solving ability in the bending industry, and out of that problem solving ability came the next important development for BTM Corporation. One problem which manufacturers of automotive trim and similar items encountered often was parts requiring holes pierced on close centres. In the drive to reduce production costs, these manufacturers were searching for ways to eliminate multiple operations which were necessary to pierce on close centres. Mr. Sawdon, in examining this problem, conceived of a press which would be thin enough in design to pierce on close centers within a single work station. Years later, after a time of development, the first BTM air powered toggle press was put on test and performed beyond all expectations. The BTM thin air powered toggle press which became our principle product line are in widespread use throughout North America, Europe and Asia. The next important development for BTM was the patented TOG-L-LOC sheet metal joining system. Later, after the introduction of the toggle press Mr. Sawdon developed TOG-L-LOC as an alternative to spot welding, riveting and other conventional methods of joining. 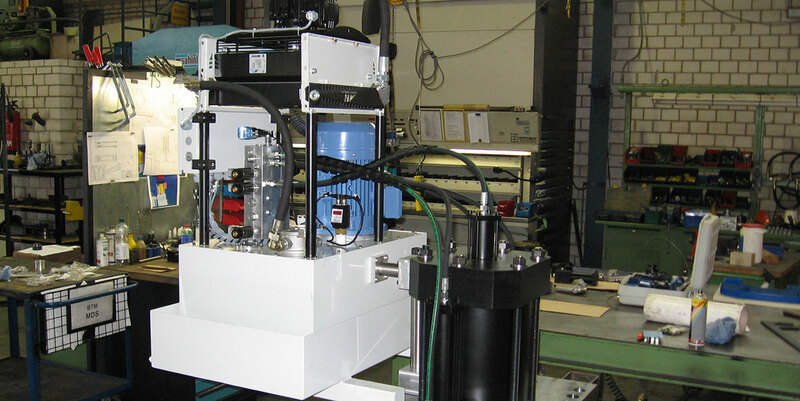 TOG-L-LOC offers numerous advantages; No rivets or fasteners, no secondary operations, reduced and simplified maintenance, no transformers or cooling lines, no heat build-up, joining of dissimilar metals and coated metals, leak-proof joints, high repeatability, non-destructive checking, long tool life and more. Numerous private concerns have subjected TOG-L-LOC to some rigorous testing programs with some impressive results, particularly in the areas of vibration resistance and consistency. The joint is produced in a single stroke, by simple punch and die tooling fitted to BTM presses or most other conventional presses. TOG-L-LOC is currently in widespread use in the production of automobiles, trucks, domestic appliances and many other conventional products, and is rapidly being adopted in the UK & European markets as a standard method of joining sheet metal components. In 1998, BTM UK relocated to its current location and restructured and is now solely owned by BTM (Europe) Blechverbindungstechnik GmbH. BTM (UK) Automation Products Ltd is a rapidly growing force in the drive for world class product quality and reduced production costs in manufacturing today.